We’d love your help. 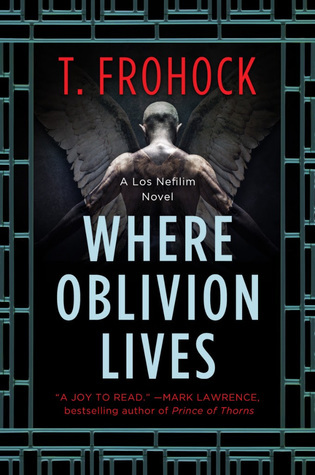 Let us know what’s wrong with this preview of Where Oblivion Lives by T. Frohock. Born of daimon and angel, Diago Alvarez is a being unlike all others. The embodiment of dark and light, he has witnessed the good and the horror of this world A lyrical historical fantasy adventure, set in 1932 Spain and Germany, that brings to life the world of the novellas collected in Los Nefilim: Spanish Nephilim battling daimons in a supernatural war to save humankind. To ask other readers questions about Where Oblivion Lives, please sign up. This is both a stand alone book and a follow up to the three Los Nefilim novellas. So that puts me somewhere between the complete newcomer and the reader who has finishing Los Nefilim. I think Frohock has succeeded in making Where Oblivion Lies accessible to new readers, and that the existence of the trilogy provides a sense of depth and history to the book. Where Oblivion Lies is set i OUT TODAY! Where Oblivion Lies is set in 1932, primarily in pre-Franco Spain and wandering into pre-Hitler Germany (via France). The sense of period is well conveyed and it all feels convincing to me. The story concerns the machinations of angels, demons and their offspring, mostly their offspring, the nefilim who are essentially reincarnating, long lived humans, with a magic based around song (not what you're imagining but more to do with powering sigils with the right note or sealing portals with the right music - we're talking classical violin here, not rap battles!). It's beautifully written. You can rely on Frohock for clear writing and, when the situation demands it, beautiful prose. Frohock also builds strong relationships between characters that you believe in and care about. The story itself is a slow burn leading to an exciting crescendo with some genuinely creepy vibes. As a tone deaf musical ignoramus I was still able to enjoy the music based magic and the hunt for a musical key to achieve an important goal. In that respect it was similar to the musical interludes in The Name of the Wind where the quality of the writing carried me through despite my lack of understanding of the fine points of ... notes ... and ... stuff. I enjoyed reading this and if it sounds interesting to you then it very likely will be! I'm taking advantage of the Kindle notes to add annotations to the text in case anyone is interested. You can find the Kindle Notes here. There are currently five, but I'll be adding more over the next few days. If you enjoyed the Los Nefilim novellas--In Midnight's Silence, Without Light or Guide, and The Second Death--check out Where Oblivion Dwells. Diago and all of the nefilim are back for a brand new adventure. Bonus points for getting to do a novel, so I'm able to share more of Los Nefilim's I'm taking advantage of the Kindle notes to add annotations to the text in case anyone is interested. This is one of those where I need some time to put my thoughts into order. Gorgeously lyrical, T. Frohock weaves a lush tapestry. At times beautiful and brutal, I am in awe of this unbelievably talented story-teller. Highly recommended! This takes everything I loved about Los Nefilim and improves on it, which is quite a feat! Some books just click and this was one of those times. It wasn’t even that there is much in the way of my bullet-proof likes either- Angels are not an auto-buy for me, and historical fantasy is probably closer to an auto-skip. But there was something about this story that resonated (a little pun intended) and part way through I knew I was going to have to go back and read the rest of the series, as soon as my schedule allowed. Now a member of the Los Nefilim, Diago’s work on the key is being hamp Some books just click and this was one of those times. It wasn’t even that there is much in the way of my bullet-proof likes either- Angels are not an auto-buy for me, and historical fantasy is probably closer to an auto-skip. But there was something about this story that resonated (a little pun intended) and part way through I knew I was going to have to go back and read the rest of the series, as soon as my schedule allowed. Now a member of the Los Nefilim, Diago’s work on the key is being hampered to the point he can no longer ignore it. His instrument, a Stradivarius (violin) is being used against him like a weapon in a type of psychic attack. Suffering from crippling hallucinations and what is essentially the equivalent of PTSD he sets out to locate the source and retrieve his Violin. The magic is music based, shaping tones and sound to create sigils/glyphs. It’s accessible and you don’t need to be a music prodigy to understand it. I loved the use and how music, combined with the setting, with Hitler on the rise and Spain on the verge of civil war, gave the story a very unsettled, haunting quality that heightened the sense of danger. The characters- I’m a of a sucker for those outsider type characters- the ones that feel like they are walking a tight rope in their head trying to do the right thing. That only really need someone to believe in them for them to believe in themselves. Diago, feels a bit like that kind of character to me. He’s found redemption and a family and will do anything to protect it. To back Diago up- there are people who love, trust and support of him but who also occasionally have real fears and doubts that he wont trust himself enough to be the person they know he is. Villains- IMO, some of the best villains are the ones that have a past with the main character. A little history goes a long way and, in this case, Diago’s shared history in his past incarnation, adds a deeper layer making not only the relationships between all the characters more complicated but also making this more than just a grasp for power story. The reincarnations/memories- I tended to think of these as something like the reincarnated version of the Highlander tv show where McLeod would have a history with a person and we’d get glimpses of characters past together to set up the back story/relationship. I don’t usually even comment much on the writing in a review unless it stands out. But nothing says better what kind of writing to expect than that phrase-which honestly gave me a little thrill every time it came up. Used like goodbye, it’s double meaning with the reincarnations, also serves as a reminder of how dangerous their lives are. That the next time they may see one another is in a future incarnation. I really liked the punch that it added and I think it’s a perfect example to use here to show the thought that was given to the writing in every part of this story- from the word choices, to the setting, the music, the characters, and the past lives. The writing alone could have felt almost stark but the combined elements assist in bringing the world alive through all of our senses. For me this was the distinction that made this an outstanding read. I would have given this book six stars if GoodReads would have let me. Well worth checking out and quite easy to jump in at this point. But, I can guarantee if you’re like me, you’ll want to go back and catch this series from the start. Teresa Frohock is a true hidden treasure whose work deserves a much wider audience. Her current work, of which I received and ARC, is a novel continuing the tales in the Los Nefilim novellas, set during the time of the Spanish Civil War and continues the story of Diago, born of daemon and angel, his husband Miquel and their son as Diago continues to gain the trust of the Nefilim in their quest to maintain the peace between the immortals, whose conflicts parallel events in our world. Teresa’s pro Teresa Frohock is a true hidden treasure whose work deserves a much wider audience. Her current work, of which I received and ARC, is a novel continuing the tales in the Los Nefilim novellas, set during the time of the Spanish Civil War and continues the story of Diago, born of daemon and angel, his husband Miquel and their son as Diago continues to gain the trust of the Nefilim in their quest to maintain the peace between the immortals, whose conflicts parallel events in our world. And it's going to be a full-lenght novel, too! Hurrah!!! It was great to see a novel-length Los Nefilim story, as well as seeing some real flashbacks to past incarnations and just more in-depth exploration of the greater politics around and above Barcelona. My only knock against this book is that I wanted more Diago/Miquel/Rafael time compared to the novellas. But wow, are some of these characters quite damaged inside--and with the Spanish Civil War about to start in 4 years, I don't see this getting any better for them. 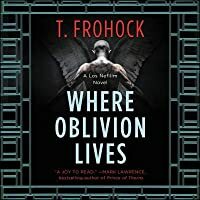 WHERE OBLIVION LIVES is a well-written, historically grounded, evocative dark urban fantasy. While designated Los Nefilim #4, there being 3 previous novellas, reading the novellas is unnecessary for the full appreciation of this book, though it is likely to spur you to obtain the novellas post-haste. It is a tale WHERE FAMILY LIVES and thrives—family forged by blood, and family that is hand-picked and formed by voluntary bonds. The central family consists of Diago (half-angel, half-demon), Miquel WHERE OBLIVION LIVES is a well-written, historically grounded, evocative dark urban fantasy. While designated Los Nefilim #4, there being 3 previous novellas, reading the novellas is unnecessary for the full appreciation of this book, though it is likely to spur you to obtain the novellas post-haste. It is a tale WHERE FAMILY LIVES and thrives—family forged by blood, and family that is hand-picked and formed by voluntary bonds. The central family consists of Diago (half-angel, half-demon), Miquel (a Nefil), and Rafael, Diago's recently discovered son with a prior tryst with an angel. The central family is embraced by another family, that of Guillermo, leader of the Nefilim. Beyond that lies all the Nefilim who have collectively accepted the central family, though not without suspicion, particularly of Diago and his split origin. This book is WHERE MAGIC LIVES. First, there is the magic employed in the story in the form of music powering special sigils—magic heard, seen and felt. Voice, instruments, anything that produces musical tones can lend strength and force to magical symbols. Second, there is the magic of T. Frohock's lyrical prose, painting a canvas of emotions. There is a palpable sense of underlying danger. The language, tone and turn of phrase Frohock adopts lend themselves to instinctively feeling fear for Diago, Miquel, Guillermo—in the manner one fears for loved ones. Almost from the outset—especially if you've read the novellas—the reader feels connected, relates to, and sympathizes with, the characters, fears for them, hopes against hope for their survival. The backdrop is WHERE HISTORY LIVES. We revisit history in this tale grounded in 1932 Spain and Germany during the rise of nationalism, where the seeds of World War II were sown. To this increasing political turmoil, Frohock adds a supernatural battle between nefilim—marshals of angels, near immortal, with the power of reincarnation—and daimons. The historical aspect is obviously well-researched, the fantasy addition is highly imaginative, and they are seamlessly interwoven. The quest for The Key that unlocks the secret to unifying and harmonizing the Nefilim's collective voice is WHERE THE FUTURE LIVES. The world is in jeopardy and powerful as a nefil may be, no single voice alone is powerful enough to avert disaster. Diago has caught snippets of The Key but must unravel his past to unlock it in its entirety. T. Frohock reminds us WHERE HOPE LIVES--ensconced in the unwavering resolve to do the ought. Attempts may fail; attempts will fail. But re-orienting all attempts to this most righteous and noble of intents is the rudder without which only failure is guaranteed. Loved ones are the constant-- always celebratory in success, reassuring in failure, comforting in despair, and forgiving before offense is even committed. Failure remains a possibility but a risk worth taking. Where mistakes and failure may be found is also WHERE REDEMPTION LIVES. With the power of reincarnation comes past lives and the regrets that attend them. Diago, Guillermo, and the others are haunted by ghosts of their pasts and the reverberating consequences of prior choices and decisions throughout time. Old enemies join forces with new ones to create greater peril. To maneuver through all this, Diago & Co. must work through the imperfections of memory, the disconnect between actual events and one's hazy, tenuous, incomplete recall of them. In order to prevail, they must come to terms with their past and exorcise old demons. The most dangerous enemy each of the characters must face may just be themselves. A world where people of seemingly disparate origins and backgrounds are able to get past differences and overcome bias and suspicion is WHERE LOVE LIVES. Some may talk of purity of race, define family in the most narrow of ways, appoint themselves protector of virtue but, ultimately, the only pure thing is love that is persistent, gratuitous, unconditional, enduring. Short Review: Historical UF with angels, exactly the balm my soul needed with this genre. Perfect sequel to the first three novellas. I love the characters, and I loved the story. I can't wait to see more in this series. Once again, Where Oblivion Lives is everything I needed in an urban fantasy novel. I didn't just want everything to do with this novel, I needed it to soothe a To read more reviews in this series and others, check out keikii eats books! Once again, Where Oblivion Lives is everything I needed in an urban fantasy novel. I didn't just want everything to do with this novel, I needed it to soothe a part of my soul that has been struggling against the world. I was drawn into this story with Los Nefilim and I continued to be enchanted through Where Oblivion Lives. From the moment I started, I didn't want the ride to stop. The lore surrounding the Angels and Demons is just outstanding. There is nothing worse than a weak, humanic, angel and demon race set, but these are good, strong, proper races in Where Oblivion Lives. The plays these two races make are anything but weak. There wasn't as much demonic action during Where Oblivion Lives, but the actions of everyone else more than make up for it. The way music and sound are interwoven into magic...well, it is pure magic itself. Frohock understands that everything is based on vibrations, and if you can change that, you can change the world. It is perfect and exactly what I love in my magic. In a departure from the majority of the novellas, Diago shares his time with Guillermo and others. The shift from focused novellas to focused novel was handled very well, and I cannot wait to read more full sized stories like this in the future. Where Oblivion Lives has many facets and players, each thinking they are in the right. But, everyone can't be remembering true. The idea of multiple incarnations is explored a lot more in this story. Remembering something in a past life isn't easy, though, and can be used for good or ill. I don't like memory loss, but this isn't memory loss. This is something fundamental to the beings that are nephilim, and I wouldn't have it any other way. It is perfect. I also love how the mortal world and the supernatural world are interwoven together. Spain is gearing up for civil war, and the characters are aware of the trouble that is ahead of them. The world is a decade away from another world war, which they have seen the signs of as well. It is great how Frohock weaves the two worlds together, with mortals not having any knowledge of their world, and the Nefilim belonging to the mortal world and not. It can be a difficult task for an author to show how the characters belong to the mortal world while also not, and it is often overlooked entirely when there is a masquerade in effect. The fact that it isn't overlooked and it is well handled just raises this series in my eye even more, and I didn't think it could get much higher! Where Oblivion Lives was everything I wanted and needed right now. This series has already jumped up onto my favourites and I cannot wait for the next installment of this series. I love Diago and his family and I need to see them grow together more. A delightful standalone excursion into the world of Los Nefilim, part spy thriller, part gothic horror, part magical warfare, as the husband and husband team of Diago and Miquel navigate dangers across Europe on the eve of the Spanish Civil War. Soundtrack:Happy Days are Here Again! It's a happy day indeed, so many things I like in one place! Midway through the book I realized it's fourth in a series, so now I have some catching-up to do. An interesting magic system. Music-imbued sigils? Yes please! If you follow the text, you can listen to a pretty interesting soundtrack. It was great to hear ol' Brahms and Berlioz as a soundtrack to angel-killing and soul-eating! A new(ish) take on an old trope. Children of angels and humans - now with Soundtrack:Happy Days are Here Again! A new(ish) take on an old trope. Children of angels and humans - now with more warfare, memories from past incarnations, and angst. The realistic portrayal of some facets of human nature. There is talk about trauma, PTSD, addiction, obsession, and nightmares. The author doesn't shy away from the violence, but manages to convey a sense of camaraderie and hope in her characters, which I came to appreciate (I blame too much of Abercombie in a short time period for my disdain of grimdark, really). The music. I repeat myself, but of, what joy! It makes me overlook a somewhat odd pacing and over-dramatics. For those who are new to the series, Los Nefilim presents an early 1930's Europe in which nefilim, the children of angels and daimons, live hidden amidst mortal kind and serve the angels as earthly soldiers in the angel-daimon war. We follow the activity of the Spanish nephilim branch, Los Nefilim, particularly one Diago Alvarez--a half-angel, half-daimon being who's recently been inducted into the organization. While I'd enjoyed the novellas (the characters in particular), I did feel like I was For those who are new to the series, Los Nefilim presents an early 1930's Europe in which nefilim, the children of angels and daimons, live hidden amidst mortal kind and serve the angels as earthly soldiers in the angel-daimon war. We follow the activity of the Spanish nephilim branch, Los Nefilim, particularly one Diago Alvarez--a half-angel, half-daimon being who's recently been inducted into the organization. While I'd enjoyed the novellas (the characters in particular), I did feel like I was getting held back on the worldbuilding and nefilim lore. This full-length novel firmly addresses those problems. So now we get the heart-tugging family dynamic of the novellas plus a deeper exploration into the nefilim's magic and their history. The story also widens its field of view to include Germany, introducing a new kind of tension relating to growing Aryan supremacy and too-curious Nazi officers. While we don't see a lot of interaction between Diago and his companions (and thus not a lot of development), what we do see of the characters individually I really liked. Diago's existence continues to spit in the face of toxic masculinity. Besides being a badass half-angel, half-daimon being who can harness musical energy, he's also a loving husband, doting father, and a battler of PTSD, full of insecurities and fears but also a willingness (however reluctant) to voice them, which frankly makes him all the more badass. Rafael continues to be the best kid character I've encountered in adult fantasy in the past year. So sweet. So adorable. So authentically child-like--not an adult's skewed vision of what a child should be. And so incredibly bad for my heart because it melts every time he shows up on page. "Don't come home beat up. Every time you go away without us, you come home beat up." Disappointingly, Diago's husband Miquel takes a backseat in this story, but on the upside, we do see a lot of Guillermo, the leader of Los Nefilim, and through his eyes we get more deeply entrenched into the political side of the war which I wholly enjoyed. When you lay out such a seemingly mundane setting and plop down a character who's as powerful as Diago is and still manage to make the readers fearful for him, you'll hear me applauding in the background because that's such a hard thing to pull off. This is such a beautiful read. Miss Frohock is a master word smith, and it is no wonder her work enjoys such appreciation from fellow authors. Very few authors can weave emotions in their story so compellingly. Frohock is a master at it. Where Oblivion Lives although starts slowly, it doesn't give you a breather towards the end of the book (in a good way). While I have really enjoyed the previous Los Nifilim books, this one was a feat as it conveyed so much in such less number of words. Frohock ta This is such a beautiful read. Miss Frohock is a master word smith, and it is no wonder her work enjoys such appreciation from fellow authors. Frohock talks about war with a responsibility that is remarkable. It is a very well explored theme in the book: how big a disaster a war can be, and how the it impacts people years later. (view spoiler)[ Another underlying theme is of owning your past, and accepting it to move ahead in present. The book explores the relationships beautifully; Diago's relationship with his son, his husband, his friends specially Guillermo, and overall Los Nefilim (Damn its tough to remember the write spelling for each group of Nefil). But what shines through for me is each and every interaction between Diago and Rafael. The father son duo are a treat and I wanted to spend days in their household. The book ends beautifully. (view spoiler)[ The subtle shift in behaviours of Carme and other Los Nefilim towards Diago is awesome. The story is about coming back home. The title of the last part "Free at Last", could not have been more apt. (hide spoiler)] Although continuation of the story is implied, the ending left me really satisfied. The Magic system of the books is amazing. Although it can be read as a standalone, I would recommend new readers to start from In Midnight's Silence. P.S. I love the names of the books in this series. The descendants of angels use magic based on music, in this cool adventure story based in 1930s Spain. The author says the hero of the story is inspired by The Shadow -- a cool detail on its own -- but that is a touchstone of the depth of influences and creativity that is apparent here. Books about angels fighting demons have been done before, but this one sets a high bar. This book is an action-adventure worthy of any pulp story, but the author adds a sense of time and place that was not always there in the pulp era. 1930s Spain is just as important a setting as Gotham City is to Batman. I won this ARC in a Goodreads giveaway. This is the first book by the author and the first book in this series I have read. I haven't had the best luck with books about Nephilim and the like in the past so I was prepared to be disappointed or at least underwhelmed (this may have worked in the books favor). Honestly the flow of the story is way better than similar series that I've read and the characters felt more genuine and likeable than those of the Shadowhunter series. The books pacing never r I won this ARC in a Goodreads giveaway. This is the first book by the author and the first book in this series I have read. Having not read any of the other books in the series, this book can be read as a stand alone. It did a good job at explaining the angel and demon background stories and left me at an ending that will make me want to read the next novel in the series. It is written very well, the story moved along at a good pace, and it kept me interested. It is in the LGBT genre, but no sexual context. I'm not interested in the genre, but glad I didn't let it stop me from entering the giveaway for this book.